Dr Karl has something to say about coconut water and 'superfood' claims. If there’s one thing we’ve learned in 2014, it’s that a humble bottle of water can be trendy – especially when it comes from a coconut. In fact, anything derived from a coconut has achieved the mythical ‘superfood’ status in recent years. Coconut oil has become the pantry item/makeshift beauty product du jour, while coconut water is having an Evian moment, being carried around and added to green smoothies by health nuts all over the country – and the rest of the globe. Worldwide, coconut water sales hit half a billion dollars last year. Coconut’s meteoric rise to popularity is largely based in its widely-lauded health advantages. 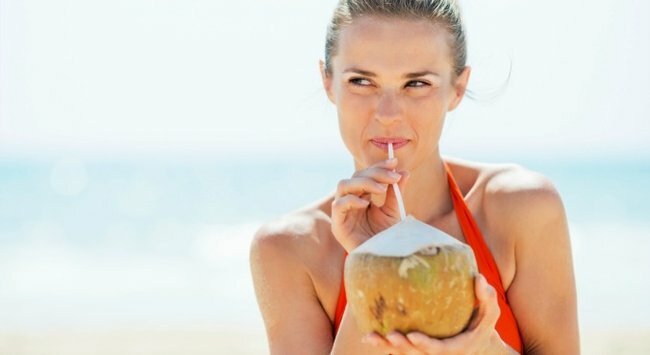 These coconutty health claims run the gauntlet from helping you lose weight, slowing the ageing process, lowering blood pressure and benefiting digestive and urinary health; to the suggestion that coconut water can help to dissolve kidney stones. Phew. That’s a lot of work for one product to do. So do these big claims hold any (ahem) water? Like many, Dr Karl Kruszelnicki is sceptical. The Australian scientist, author and all-round clever man has taken a close look at coconuts and their various products for the ABC, and his findings… well, they might just rain on the coconut parade. "[Coconut water] is moderately rich in potassium and also contains small amounts of minerals such as magnesium, calcium and phosphorus," he writes on the ABC. "However, both the banana and the potato carry roughly the same amounts of potassium — and you don&apos;t see potatoes being endorsed by celebrities and sold as the next crackpot Superfood." Furthermore, Dr Kruszelnicki says coconut water is no better at rehydrating your body than sports drinks or plain ol&apos; tap water, despite the claims that it serves as &apos;nature&apos;s Gatorade&apos;. "The false marketing claim that it is superior as a rehydration liquid to sports drinks was withdrawn in the USA after a 2011 class action lawsuit," he writes. So no, coconut water isn&apos;t bad for you - but it&apos;s not a magical cure-all. Also, here&apos;s a not-so-fun fact: if you drink too much of it, you may experience a laxative effect. So... yeah. Be careful out there. As for coconut oil, Dr Kruszelnicki warns that while its uniquely high saturated fat level - 91%, if you&apos;re curious - makes it perfect for storage purposes, it&apos;s probably not so great for your body. "[Saturated fats] are very strongly associated with bad blood cholesterol levels and heart disease," he explains. "Sure, a small amount of coconut oil occasionally would not be a major problem. But consider this — the Western diet is already high in saturated fats, so why add more?" His recommendation? Stick to the much more affordably-priced olive oil. You can read the rest of Dr Karl&apos;s findings here. Do you drink coconut water? What compelled you to try it?